Almo Nature Daily Menu Paté is a meat-based paté for dogs made from pure ingredients. 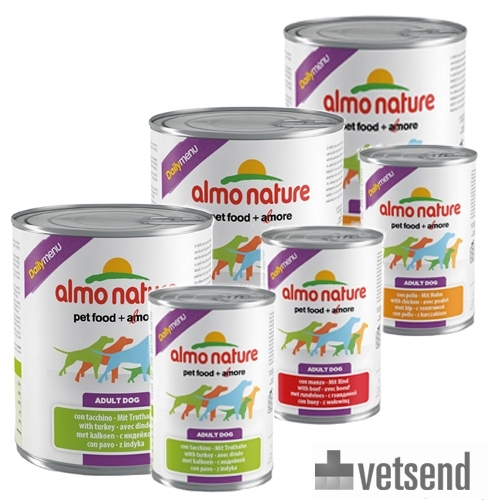 Almo Nature Daily Menu Paté is a meat-based pate for dogs made from pure ingredients. Almo Nature presents "Daily Menu Paté" for dogs. This paté is specially made of extremely high quality meat and vegetables and is rich in natural vitamins. This paté also contains rice, which is a source of carbohydrates. The meat and vegetables are cooked and prepared without chemical treatment. Through this process, the meat's nutrients and flavours are preserved and no minerals or vitamins are added, as they are already found in the meat and vegetables. In all Almo Nature foods, no chemical preservatives or flavourings are added. For dogs, dry food is the basis of nutrition. The combination of dry food with Almo Nature Daily Menu Paté stimulates the dog's sense of smell. This contributes to an even tastier meal and the dog gets more nutrients that are required for an optimal, balanced diet. Daily Menu is available in 3 different flavours that come in 24 cans of 400 grams or 12 cans of 800 grams. Have you used Almo Nature - Dog - Daily Menu Paté before? Let us know what you think about this product.